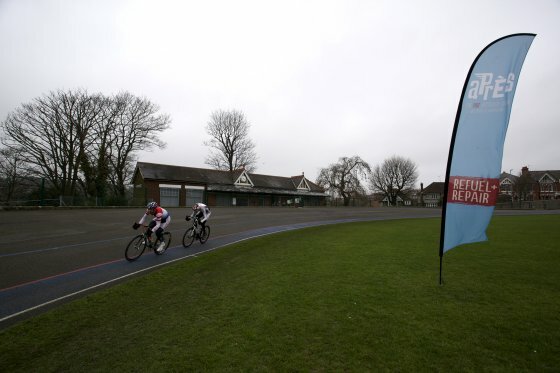 Despite being closely marked throughout, Simon Brooks (VC St Raphael) notched up yet another victory in the ninth round of the Apres Hot Recovery Drink Winter League at Preston Park in Brighton. Brooks (VC St Raphael) unlocked the door with a late rally with ten minutes to go with Abellio SFA Racing’s Matthew Huli close on his wheels. Turning the screw, they created a gap and then stretched and maintained their lead. Simon attacked again with two laps to go and left a content Huli with second spot. Ryan Visser took the sprint in the following break of five. The third cat race saw a lesson in timing and testing with an impressive display from Brighton Excelsior’s Steve Kane hanging out in a long solo break which yo-yoed out before the usual arguing and indecisiveness meant the bunch lost their chance to chase. A good scrap continued though till the end with Dynamo’s Jeremy Brougham taking the sprint from Kingston Wheelers’ Simon Barnes and junior Nile Jones. In the fourth cat race a couple of sincere digs were reeled back until the inevitable last few were caught, with Brighton Mitre’s Ian Monaghan going for a long one with two to go. A marauding pack caught him 25 metres from the line, clipping him and sending him down (fortunately on his own) with Bristol South CC’s Anthony Clark winning by a couple of lengths. Worth the trip!